Pustejovsky, James and Amber Stubbs. 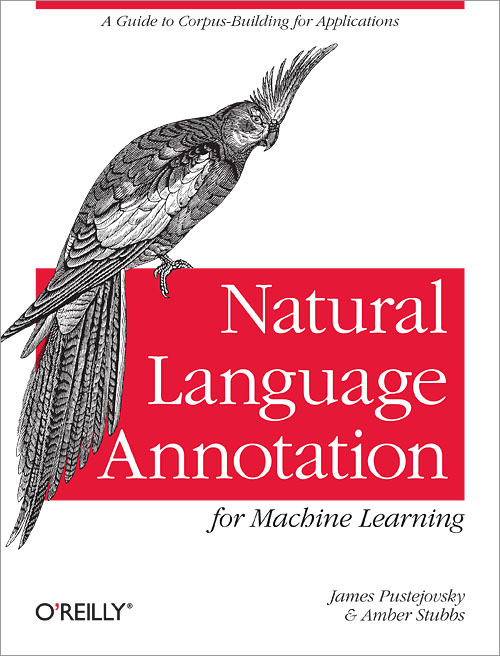 Natural Language Annotation and Machine Learning. O’Reilly Publishers, 2012. Interpreting Motion presents an integrated perspective on how language structures constrain concepts of motion and how the world shapes the way motion is linguistically expressed. Natural language allows for efficient communication of elaborate descriptions of movement without requiring a precise specification of the motion. 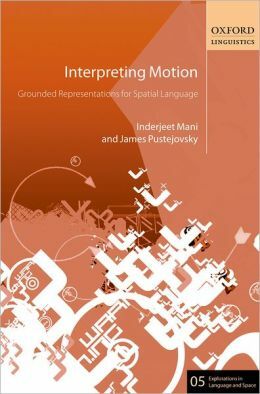 Interpreting Motion is the first book to analyze the semantics of motion expressions in terms of the formalisms of qualitative spatial reasoning. It shows how motion descriptions in language are mapped to trajectories of moving entities based on qualitative spatio-temporal relationships. 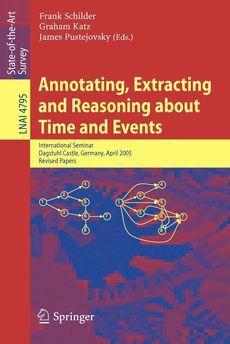 The authors provide an extensive discussion of prior research on spatial prepositions and motion verbs, devoting chapters to the compositional semantics of motion sentences, the formal representations needed for computers to reason qualitatively about time, space, and motion, and the methodology for annotating corpora with linguistic information in order to train computer programs to reproduce the annotation. The applications they illustrate include route navigation, the mapping of travel narratives, question-answering, image and video tagging, and graphical rendering of scenes from textual descriptions. The book is written accessibly for a broad scientific audience of linguists, cognitive scientists, computer scientists, and those working in fields such as artificial intelligence and geographic information systems. The Generative Lexicon presents a novel and exciting theory of lexical semantics that addresses the problem of the “multiplicity of word meaning”; that is, how we are able to give an infinite number of senses to words with finite means. The first formally elaborated theory of a generative approach to word meaning, it lays the foundation for an implemented computational treatment of word meaning that connects explicitly to a compositional semantics.In contrast to the static view of word meaning (where each word is characterized by a predetermined number of word senses) that imposes a tremendous bottleneck on the performance capability of any natural language processing system, Pustejovsky proposes that the lexicon becomes an active — and central — component in the linguistic description. The essence of his theory is that the lexicon functions generatively, first by providing a rich and expressive vocabulary for characterizing lexical information; then, by developing a framework for manipulating fine-grained distinctions in word descriptions; and finally, by formalizing a set of mechanisms for specialized composition of aspects of such descriptions of words, as they occur in context, extended and novel senses are generated.The subjects covered include semantics of nominals (figure/ground nominals, relational nominals, and other event nominals); the semantics of causation (in particular, how causation is lexicalized in language, including causative/unaccusatives, aspectual predicates, experiencer predicates, and modal causatives); how semantic types constrain syntactic expression (such as the behavior of type shifting and type coercion operations); a formal treatment of event semantics with subevents); and a general treatment of the problem of polysemy. Language, Speech, and Communication series. Pustejovsky, J. 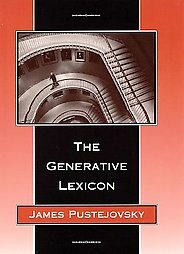 The Generative Lexicon, MIT Press, Cambridge. 1995. This book integrates the research being carried out in the field of lexical semantics in linguistics with the work on knowledge representation and lexicon design in computational linguistics. 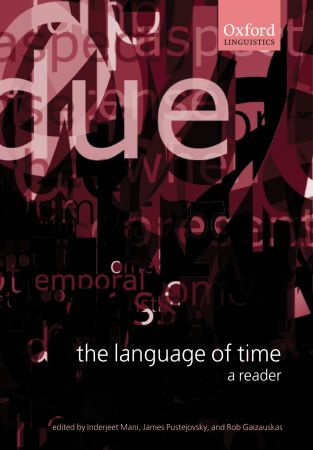 It provides a stimulating and unique discussion between the computational perspective of lexical meaning and the concerns of the linguist for the semantic description of lexical items in the context of syntactic descriptions. Pustejovsky, J. ed. Semantics and the Lexicon, Kluwer, Dordrecht, The Netherlands. 1993. This collection of papers takes linguists to the leading edge of techniques in generative lexicon theory, the linguistic composition methodology that arose from the imperative to provide a compositional semantics for the contextual modifications in meaning that emerge in real linguistic usage. 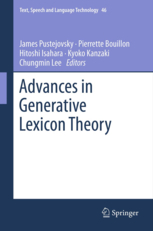 Today’s growing shift towards distributed compositional analyses evinces the applicability of GL theory, and the contributions to this volume, presented at three international workshops (GL-2003, GL-2005 and GL-2007) address the relationship between compositionality in language and the mechanisms of selection in grammar that are necessary to maintain this property. The core unresolved issues in compositionality, relating to the interpretation of context and the mechanisms of selection, are treated from varying perspectives within GL theory, including its basic theoretical mechanisms and its analytical viewpoint on linguistic phenomena. Lexical ambiguity presents one of the most intractable problems for language processing studies and, not surprisingly, it is at the core of research in lexical semantics. 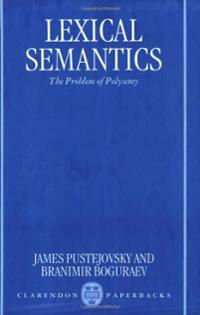 Originally published as two special issues of the Journal of Semantics, this collection focuses on the problem of polysemy, from the point of view of practitioners of computational linguistics. Pustejovsky, J. and B. Boguraev, eds. Lexical Semantics and the Problem of Polysemy, Oxford University Press, Oxford. 1997.